Terrible things were happening in the outside world. While on a standard reconnaisance mission, agent S.N.A.I.L. discovered a new doorway to the outside world in the depths of Box Cave. In addition, S.N.A.I.L. had discovered the note. The note was simple and straightforward, a cry for help from a little girl in the outside world. The note described that the girl, Brenda by name, was in trouble with her parents because she was unable to keep her room clean. She thought that perhaps the Fuzzy Heroes could help. Dedicated to helping mankind, the Fuzzy Heroes were immediately galvanized to action. Little did they realize that the cause of Brenda's strife was a party of clandestine Renegade operatives. Their mission: Get Brenda grounded, and upset her parents enough that they would force her to once again share a room with her brother. In the depths of Castle Stuffmore, King Swineheart realized that something more was involved with the note from Brenda. He understood that in this case only the best would do. 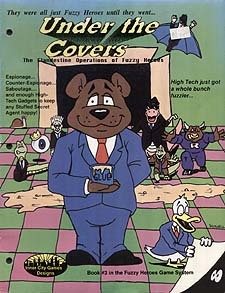 "Blue Puppy," he said, the worry plain in his regal voice, "Get me Codename C.O.A.L.A.". "Fellas, Let's show them how we do things at Castle Stuffmore!"